Low ADAMTS13 activity is associated with an increased risk of cardiovascular disease, which is generally attributed to its proteolytic effects on Von Willebrand factor (VWF). Cardiovascular health is an important determinant of cognitive decline, but the association of either VWF or ADAMTS13 with risk of dementia is unknown. Between 1997-2002, we measured VWF antigen and ADAMTS13 activity in 6055 participants of the population-based Rotterdam Study (mean age 69.3 years, 57.2% women). At baseline, 85 participants had dementia, and during 15 years of follow-up 821 developed dementia. Higher VWF was associated with prevalence and risk of dementia, unaffected by concurrent ADAMTS13 activity, but estimates strongly attenuated over time and were no longer statistically significant at 4 years of follow-up (relative risks [95% CI] per standard deviation increase- cross-sectional: 1.37 [1.06-1.77], and longitudinal: 1.05 [0.97-1.14]). In contrast, low ADAMTS13 was associated with increased risk of dementia throughout follow-up (hazard ratio per SD decrease- 1.16 [1.06-1.28]), which alike for ischaemic stroke, was modified by the presence of diabetes (P-interaction = 0.003). 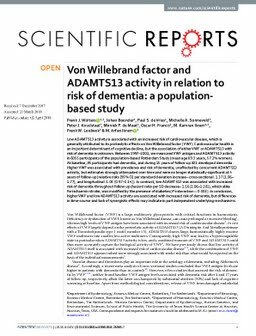 In conclusion, higher VWF and low ADAMTS13 activity are associated with increased risk of dementia, but differences in time-course and lack of synergistic effects may indicate in part independent underlying mechanisms.